After losing power in my house this week and heading out to seek any form of entertainment to keep my mind from turning to goop, I found myself alone in a theater screening of American Sniper. I’ve never been one for war movies of any kind, so I wasn’t expecting much of the Clint Eastwood biopic, but I took the plunge, figuring anything would be better than sitting in the dark… right? 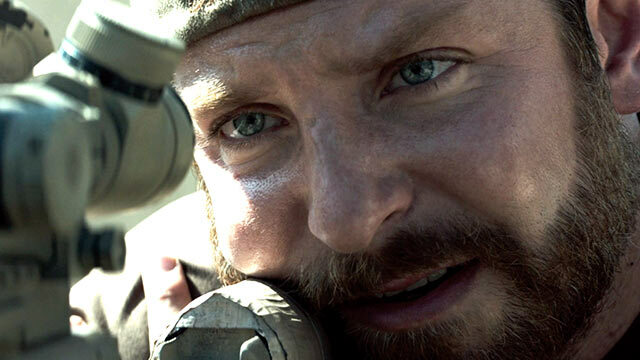 American Sniper follows Bradley Cooper as Chris Kyle, and his brutal journey in earning the title of “The Legend” as the most lethal sniper in U.S. history, as well as the emotional and mental consequences of earning such a reputation. From his life as a simple cowboy to his unfortunate death as a U.S. Navy SEAL veteran, the film covers a lot of ground from Chris Kelly’s real militaristic and family life. I’ve never read the book and have no real interest in politics, so I hope I can keep this review simply on the film itself. Truly, Bradley Cooper is the heart of the film. He sells his performance incredibly well, displaying a huge range of emotion with very little actually spoken. Cooper comes across as a genuinely humble, patriotic, likeable man, becoming very sympathetic as the war visibly takes its toll on him throughout the years. The best moments of the film come from his acting alone, and seeing his reactions all through the movie is incredibly engaging. The scenes depicting him having to make life-and-death decisions staring down a rifle scope are mesmerizing and are sure to stick with me for a while. The only other major part is done admirably as well, with Sienna Miller as his wife Taya. She isn’t given as much as Cooper, but you can easily sympathize with her frustrating life as a military wife and she has her fair share of emotional moments. The sniping scenes will leave you at the edge of your seat. The film is largely separated into two settings between Kelly’s life at home and abroad. Interestingly, as the film progresses the scenes of Kelly’s family life can be just as, if not more tense as the scenes in Iraq. I enjoyed the switching between locations, keeping the film from ever becoming stale lingering in one place too long. Seeing the horrors of war and the immediate ramifications it has on one’s home life and psyche helps the film flow more naturally and keeps the two settings and atmospheres presented from feeling too segmented. The scenes at home are more thought-provoking, focusing on some very emotional and less overt effects on a soldier’s life. I actually would have appreciated more scenes outside of and after military life, as the state of veterans and their treatment throughout and after war are definitely strong themes as well as more interesting and well-acted. The military scenes aren’t without tension though, and there’s plenty of action and brutality. As stated, the sniper scenes are among the highlights of the movie, however the more close quarters combat scenes are noticeably less engaging. They’re entertaining, but after the emotional moments of family life and incredibly tense sniper instances, the shoot-outs and more straightforward action can actually be less enthralling. It’s even harder to invest in a scene when you can’t tell which soldier running around, shooting and shouting, is supposed to be Kelly. These scenes don’t actually happen as often as I would have thought, and they’re not necessarily bad, just not as captivating as the rest of the film. There are some very powerful and thrilling moments in this half however that are absolutely necessary for establishing Kelly’s PTSD during the at-home scenes. On the other hand, the inclusion of a rival “bad guy” sniper seemed very forced and silly for such a brutal and seemingly realistic interpretation of a soldier in the Iraq war and ultimately took me out of the film a bit. The war scenes still find ways to break in the occasional emotional phone call. The film is incredibly brutal and harsh, with some shockingly violent scenes and deaths that hit like gut punches. It’s definitely not a feel good movie, but one that instead shows a glimpse into the nature of someone touted to have two hundred and fifty five kills, humanizing him and showing the pain veterans take home from war. It absolutely went against my expectations as a patriotic war movie by not glorifying it, but strongly highlighting the human element, making American Sniper much more relatable and intriguing. With some haunting and exceedingly stressful scenes, I came away from the film much more introspective than I would have thought, and am very glad I took the chance on it.